This post contributed by William Burns & Jon Richardson (video). 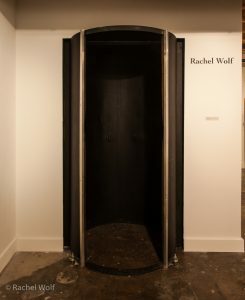 Walking through the spinning door into Rachel Wolf’s dark room is more like walking into a laboratory of playfulness than a stringent work space. There are various light sources; one flashlight has an attachment that looks like glowing spaghetti noodles. There is a disco ball, and night vision goggles. There are crystals to throw rainbows about, and various chemical compounds. Some are used in photo development, others to clean spills. It is a room where Rachel says she is, “working with the magic of the universe,” as she explores her art and quest of, “documenting light”. The road has been winding from a childhood in the last frontier of Alaska to Rachel’s discovery of photography and, “the magic of watching something appear from nothing”. She moved to the east coast for college, and had internships with Annie Liebowitz, Karen Marshall, and Harriet Casdin-Silver. Eventually, Rachel moved out to the Pacific Northwest, where she continues exploring the process of photography, camera work, and sharing that experience with others. This exploration continued in her ‘Silhouette Project’. These ‘portraits’ are abstract. The viewer can’t latch on to eyes, facial expression, or other conventions of identification.“There’s no detail,” in the image for the viewer to connect with in the usual sense. This makes it a challenge for the viewer. “The tropes we usually look at to (inform) us,” are simply not there. While Rachel was, “playing with the body”, she found herself asking, “what it then means to have somebody laying on paper?” She came to the realization that, “this isn’t a photograph or representing something else. This is that person on the paper and that index of you had to be here, to lay on that photo-paper.” In a way the image becomes more real than a standard representation. The result is an ephemeral fossil of the person, of that particular moment, of that day, and that experience. Rachel had me lay on photo-paper in order to better understand her process and experimentation. 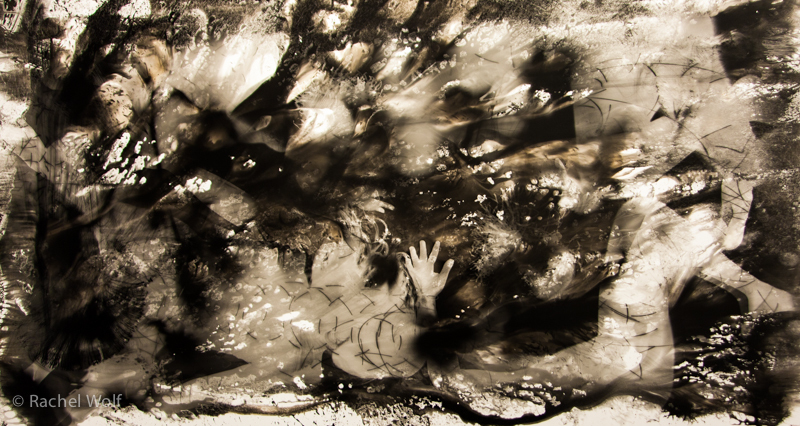 The final image of this piece in no way represents the physical me, image wise. Yet, there is an outline of my corporeal self, hidden in places, but peeking out in others. If I don’t show up and engage with the photo-paper and Rachel’s, “play with purpose,” the piece doesn’t exist. However, explaining such concepts can be difficult. It is not always possible to bring people into a dark room to experience the play and magic, especially the way Rachel wants to share it. 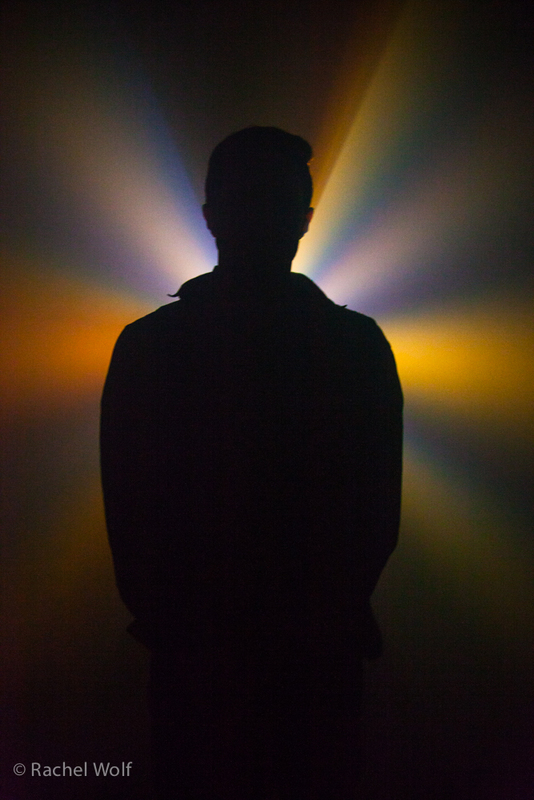 In order to explore these ideas further, Rachel built the installation ‘Stereoscopic Camera Obscura’. It was a box with two holes for the image to be projected through. 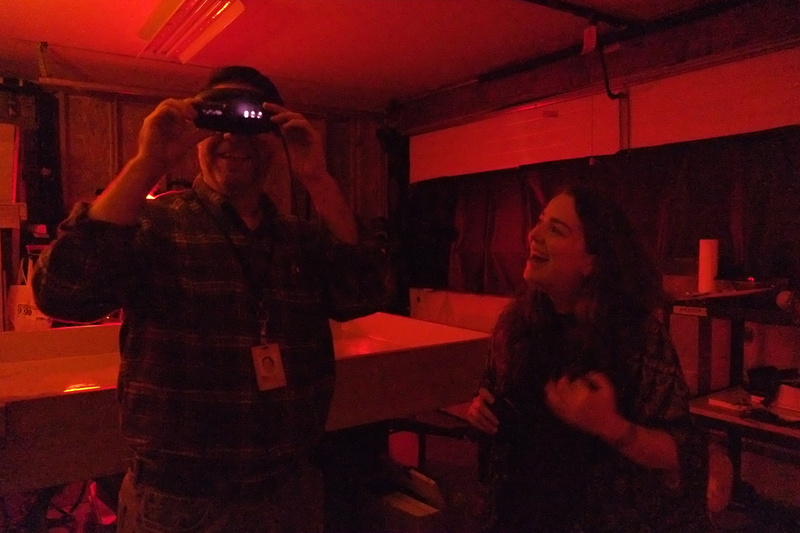 She added a red filter over one hole and a blue filter over the second hole, as well as, “a bit of mylar to reflect and bounce the light around.” Basically, she built a stereoscopic camera for people to walk into, and one of those, “best kind of happy accidents “occurred. 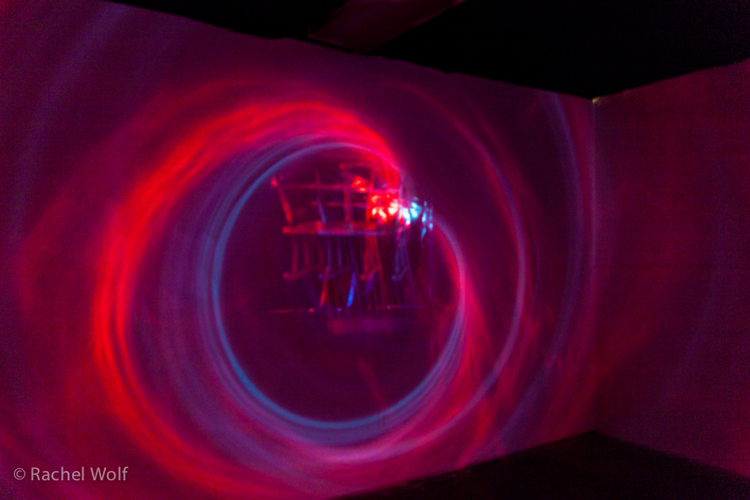 Air movement within the installation caused the mylar to “flutter” which caused the projected image to move. “It was really exciting that it wasn’t just a static image.” Rachel wanted for people, “to understand the simplicity”, and yet also see, “the intricacies and magic of the world and our visual perceptions”. To Rachel, the moving image gave the project a whole new dimension. For Rachel this project was a way for people, “to really experience this light. 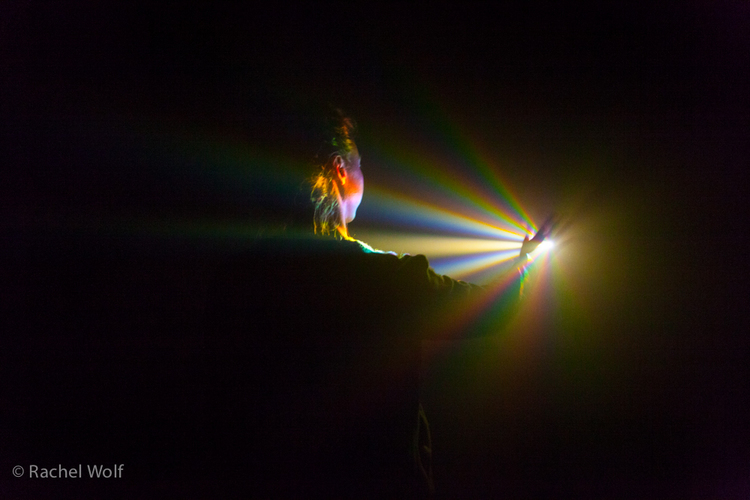 To be submerged in this light.” Participants “would walk though the dark room door and a beam of light would fall on the person.” There was a haze machine to heighten the effect of the light beam and “diffraction grating film which acts like a prism,” effectively creating a rainbow. ” I got to watch little kids just light up and play in there.” It was “just natural.” Rachel recalled how great it was to see the effect her work was having on viewers, watching “wonderment come out, and be created and expressed in that way . . .” Rachel pauses remembering, “For me the success was people telling me that they didn’t think about it, but just experienced it in that moment. They were not worrying about the experience I think I’m having because of perceived judgement, or notions of what I should be (having).” The viewers let them selves go and were immersed with in the moment and the light. 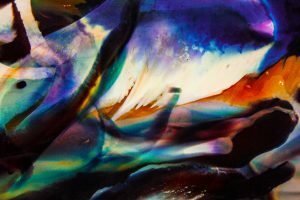 Rachel has continued exploring the magic of light and chemical play in the series ‘Alchemy’. This series is currently on view at the RSG. These are not traditional images of people or places, yet personally they seem more real. It’s not possible to walk into them, but I wish I could. The piece I own of Rachel’s is ‘Alchemy #11’. It has an almost circular spot of light, set at an odd angle, and is almost completely encircled by darkness. I look at it and it reminds me of a doorway into another realm. I am sure if I could step through that circular spot of light I would be transported somewhere magical. 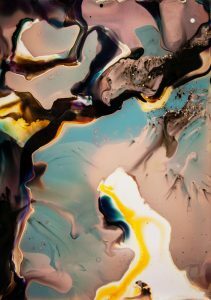 As for future experiments, Rachel is exploring color darkroom processes. She’s continuing her play with light, but also looks forward to, “having a lot more chemical play,” in what she calls “chemgrams.” She’s also continuing to explore concepts of representation, “creating objects that are about something,” but not necessarily about the image. The further use and abuse of chemicals often yields unstable results. For Rachel this is okay. 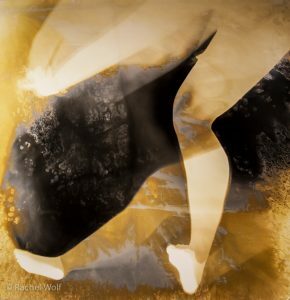 She’s comfortable wrestling with impermanence, with “images not being permanent and not being fixed.” Rachel fixes the ‘Alchemy’ images digitally, but not chemically. Leaving the original unfixed and digitally mapping it’s progress allows the original piece to continue to evolve. The image becomes different day-by-day.